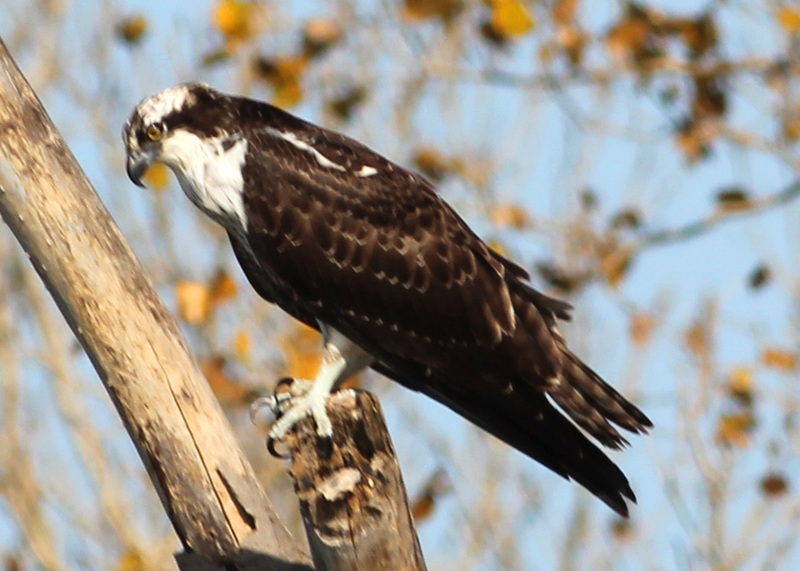 Osprey are lighter in color than most raptors. They are brown over most of their slender body with a white head and breast, a brown band that extends from their back, through their yellow eye, to the prominent black beak. They are commonly found where their perch gives them a good view of their hunting waters, such as the top of a post, tree, or navigational marker where they love building huge stick nests so they can hunt from their 'living room.' They have rebounded well since the end of DDT pesticide use that had killed their populations off to endangered levels. During their 15-20 year lifespan, they can fly 160,000 miles during migrations. The oldest recorded osprey lived to be 25 years, 2 months. In 2008, one 2-3 year old bird was observed to fly 2,700 miles from Martha's Vineyard, MA﻿, to French Guiana, South America. They are excellent fishermen. Their success rate is 1 successful catch out of every four dives, and often as high a catch rate as 70%. Their hunting time between catches averages 12 minutes. All their eggs do not hatch at once, but are spread over about 5 days. Seniority ranks their place in the nest, meaning the first born get fed first. In good hunting waters, all the chicks survive, but when food supply is more scarce, the younger chicks may starve to death.